Rivers and Roads: july crushes. Okay, so it's the middle of summer. What do I need a hoody for? Well, for one thing, southern summer nights can get quite cool and layering may be needed. I also am a major planner when it comes to buying things, and this cute hoody might just be the perfect layering item for my Christmas Disney trip! I am forever and always crushing on Chacos. The pair I've had since I was fourteen are starting to fall apart. The footbed is incredibly cracked and I'm just waiting for the day when I'm out hiking and my shoe breaks in half. :( I love love LOVE this mountain range pattern and the colors! So. Many. Paper. Flowers. I went through a major paper flower phase last year. There's just something about creating something beautiful out of something so simple with your own two hands. This book has gone on my Amazon wishlist! For months, I have been on the hunt for a new camera strap to replace the one that came with my Canon when I bought it four years ago. I want something fun and more "me". These straps from Fotostrap look incredible! If only they weren't so incredibly expensive! 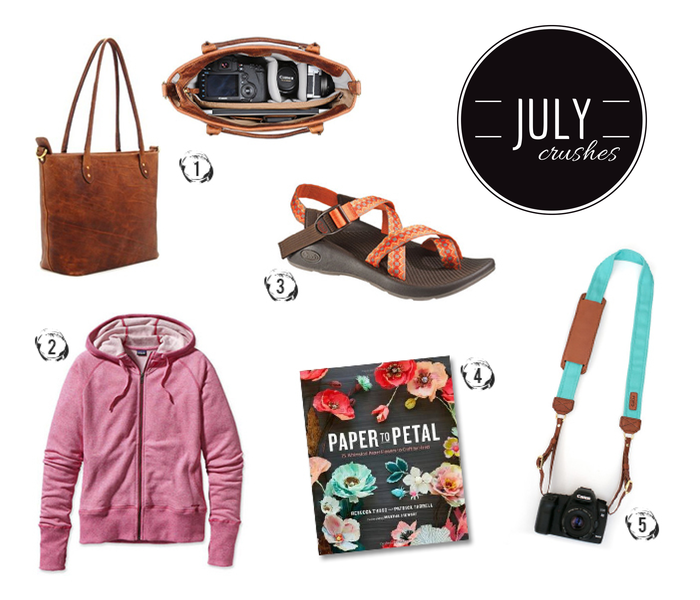 Labels: crushes., july., my style. I'm in the exact same boat as you are with most of those items! I love the ONA bags and camera strap! I LOVE that camera strap! Definitely looks more comfortable then the strap that comes with my DSLR. Found you through the link-up. Stopping by to say hello! Those camera straps are AWESOME. Probably not gonna happen though for me either! PS: Sorry I am a creeper! Blue for the hoodie. and blue for the chacos. i love the blue too!! i am undecided. i need to go try it on at our outdoor store. gosh, yes they do!! a well-worn sweatshirt is the best! I love all of these!! I want that book of paper flowers! It would look so pretty on my coffee table, and I'm sure it has some amazing tutorials! I. want. all. of. these. I've also been craving a fun camera strap! This one you picked out looks so cute :) And wow that camera bag!! Looks so sturdy and organized! Ahhhh! So many cute things! They are all so lovely! I've never had chacos before, I need to get some! Oh fun! Maybe we'll bump into each other! Have so much fun! Gosh, I know. I want that Fotostrap so bad!! Girl, they are my favorite. Obviously :) They are great for everyday and for hiking. Yesssss. I love them! They are great for every day and travel! I know, right? I'm a little obsessed with paper flowers. I just want to flip through the pages and see all the different flowers I could make!